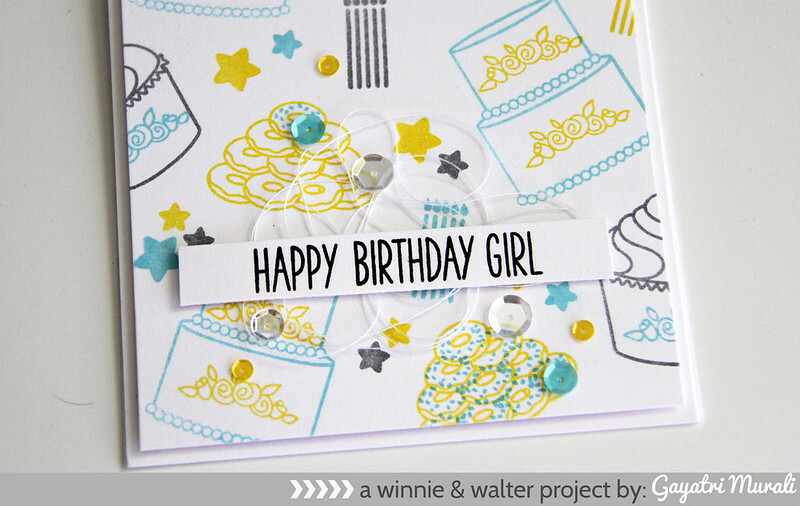 Today is Day #3 of Winnie & Walter’s 1st birthday new release. Today we are premiering Sugar Rush and Sparkle stamp sets, Big Bang Confetti and The Party Confetti Cutaways. 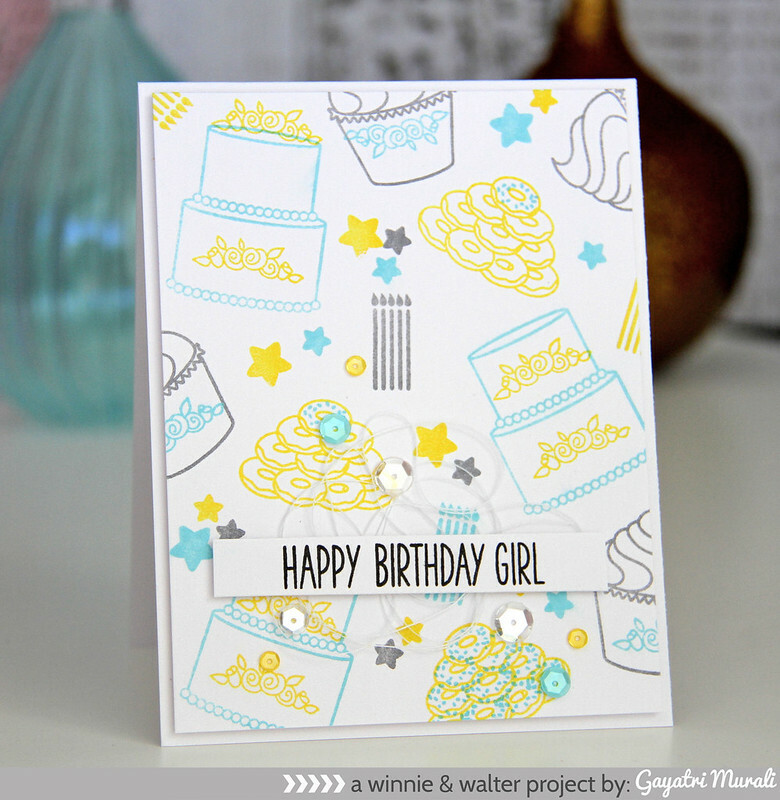 I have used the Sugar Rush stamp set to make two cards. 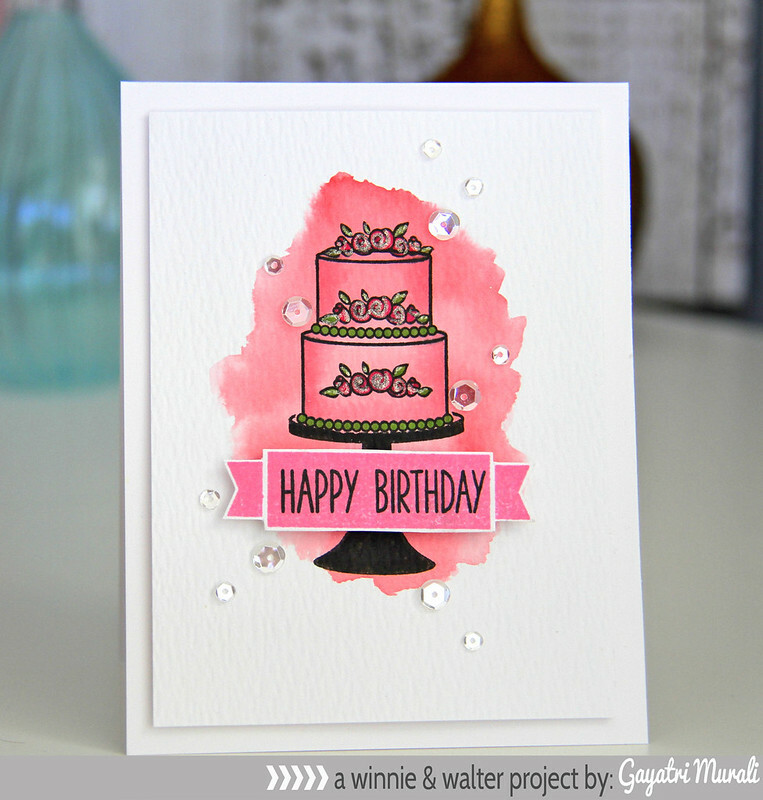 I have layered stamped the beautiful cake on the stand on pink colour wash on watercolour paper. I have stamped the beautiful flower cluster on the cake layers and on top of the cake. I coloured the flowers and leaves and shaded the cake with copics. Then used gold glitter pen, added some gold glitter to the flowers. Then sentiment is stamped on the banner, then hand cut out and adhered using foam adhesives. I have used Sparkly Clear 6mm and 4mm sequins from Pretty Pink Posh to accent my card. On my second card, I have stamped the background with all the images from Sugar Rush stamp set in yellow, blue and grey colours. I love how fresh the background looks with all the birthday images. I then stamped the sentiment on a strip fo white cardstock, trimmed and mounted on the panel with bunched up thread under it. Finally some Sparkly Clear, Lemon Drop and Aquamarine sequins from Pretty Pink Posh to finish the card. 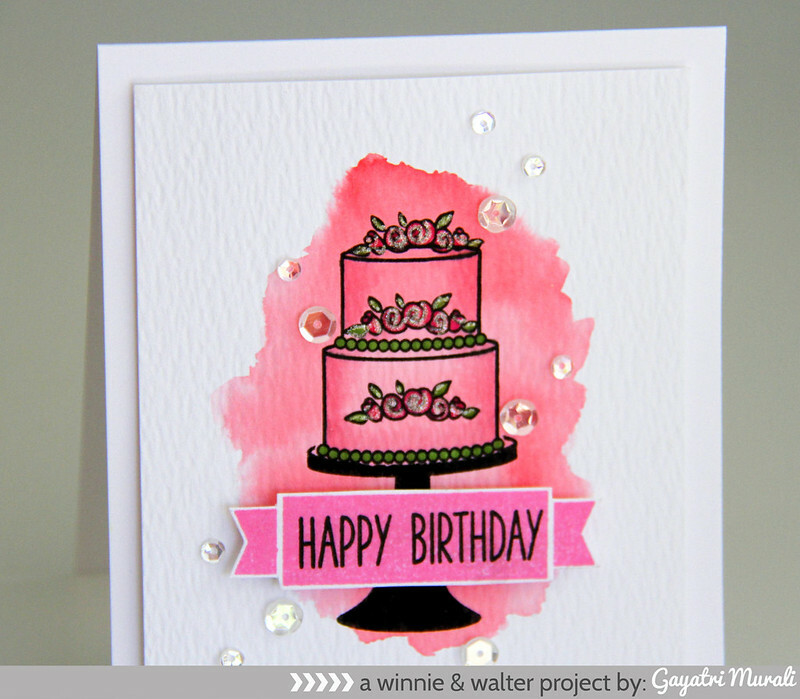 Check out Winnie & Walter blog more inspiration from Shay, Julie, guest designers and design team! You are in for a treat. See you tomorrow with day #4 new release. Oh my goodness… I love them both! Beautiful cards!!! Cute cards! I love the simplicity and watercoloring on the first and the color combo and patterned paper you created on the second is gorgeous! Wish someone would make me that 1st birthday cake…beautiful. Using the set to create that background on the 2nd card is really clever. Love the colors you've used. Terrific!!! Love them both, but that cake is amazing! !